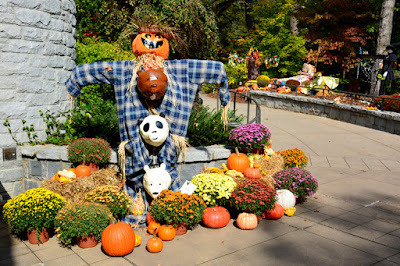 For more than a decade, Atlanta Botanical Garden visitors, Garden members, tourists, families and kids of all ages have enjoyed the fanciful, clever and always entertaining "Scarecrows in the Garden" every October. The above sparkle-eyed, height-challenged skeletons by grace the Garden annually, in different costumes and scene. 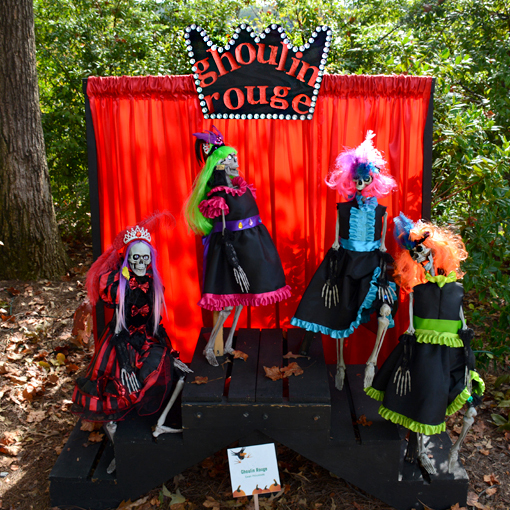 I don't know their makers, Swan Princesses, but I'm a total fan of their Ghoulin Rouge skeletons! I'm also a fan of Moulin Rouge! the movie and am looking very much forward t seeing Atlanta Ballet's Moulin Rouge The Ballet in February! Like millions of others, I've been a fan of the Minion's since the first time I saw Despicable Me. 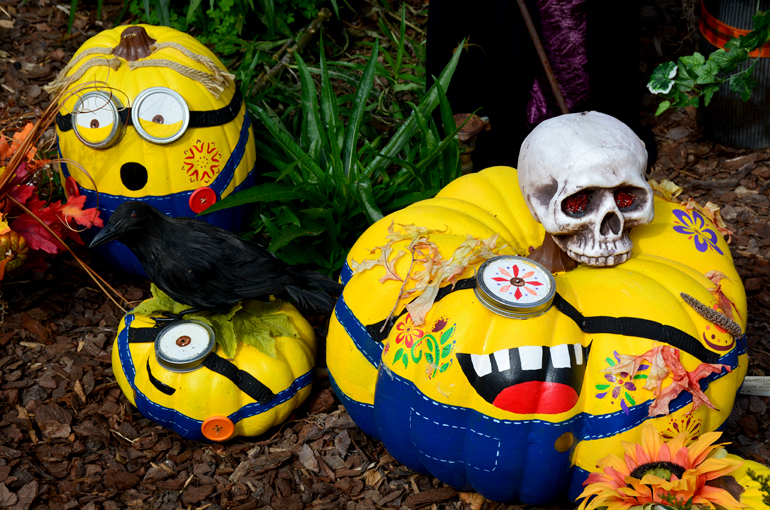 The above photo is a portion of the 1st Place winner at this year's Scarecrows in the Garden, titled "Minion's de los Muertos"! 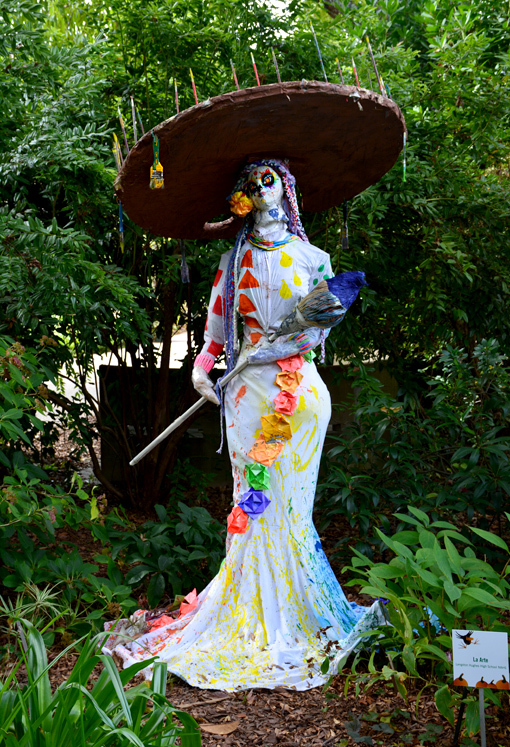 After you've enjoyed the this year's top scarecrow, created by Peachtree Petals, put the Atlanta History Center's "Day of the Dead, Dia de los Muertos" free event on Sunday, November 1. 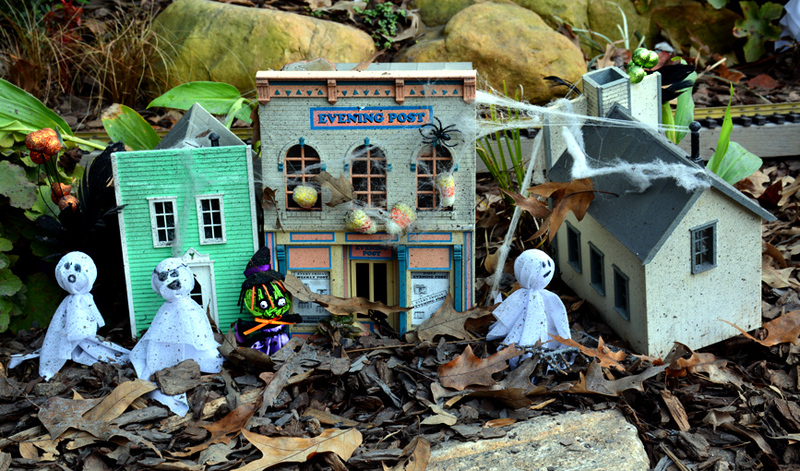 Cinema is a big influence on this year's scarecrows. 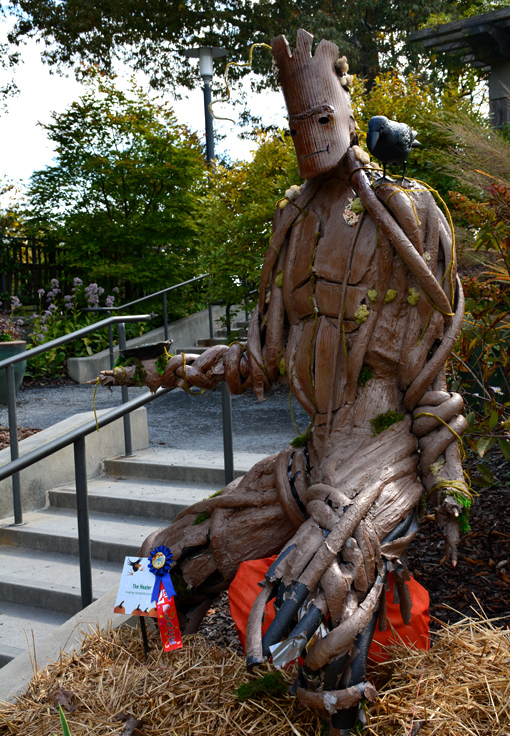 The 2nd Place winner is Groot from Guardians of the Galaxy...he's awesome! If you're a regular at Scarecrows in the Garden, there's a significant change this year. 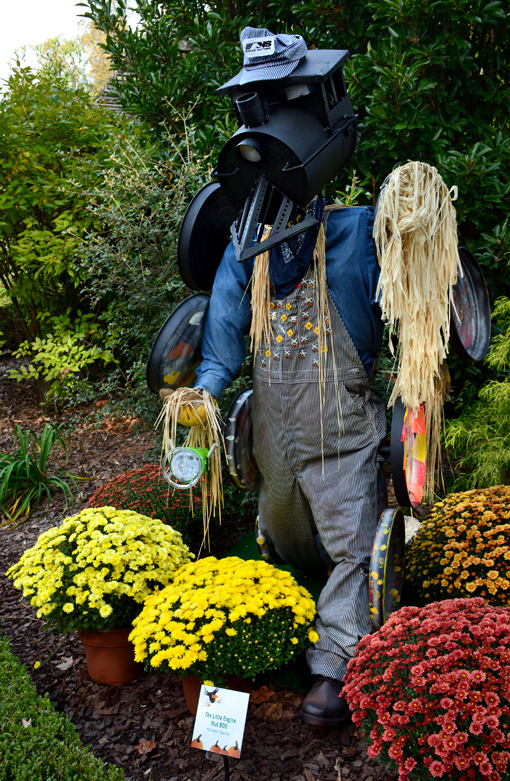 The scarecrows are typically only on the Promenade, the Southern Seasons Garden and the Children's Garden. The Children's Garden is undergoing renovation, so no scarecrows there this year. Instead, they've expanded into the Alston Overlook, the Crepe Myrtle Allee and the Perennial Garden. Not just because my name begins with a "T" and not just because I'm a dinosaur enthusiast...I love the "Mr. T" scarecrow created by the Driscoll Family! If you've ever watched The A Team, you get the humor and how clever this is. I've loved trains since I was a little kid. One of the first I was on was the American Freedom Train in 1976! I didn't understand what a wonderful experience that was at the time, I just knew that I got to get on a train where I got to see a Moon buggy! "The Little Engine that BOO! ", created by NS Better Together, is truly magnificent, and the Garden placed him near the Model Train display at Alston Overlook. 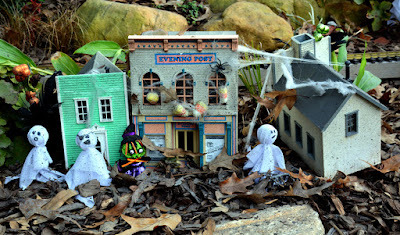 The Model Train display has been transformed into a "ghost town" for Scarecrows in the Garden! 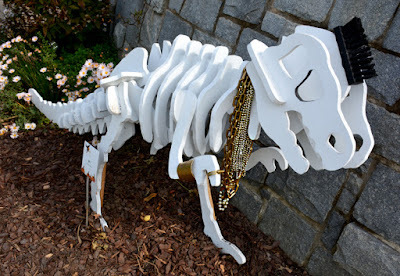 It's this kind of attention to detail that makes me a fan of the Atlanta Botanical Garden year after year. And have you heard that Chihuly is returning?! 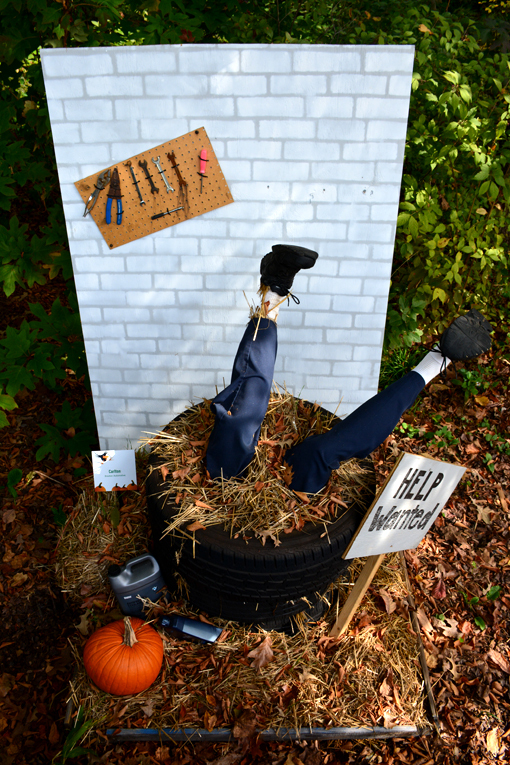 The scarecrows are created by businesses, individuals, schools and organizations. My personal favorites are the ones that are clever. The one above, by Braxton Automotive, titled "Carlton", is brilliant, funny and clever! I don't know Braxton or Carlton, but can tell how much fun they had putting this together! If you'd like to explore the Atlanta Botanical Garden more in depth, may I recommend a guided tour. They're available to Garden visitors Tuesdays-Thursdays at 1:30 p.m. There's one more "Fest-of-Ale" event this month...this coming Thursday night! During Fest-of-Ale events, the Garden is open until 10:00 p.m. The Cafe at Linton's in the Garden is open for dinner and the new Linton's Petit Cafe is also open during Fest-of-Ale. 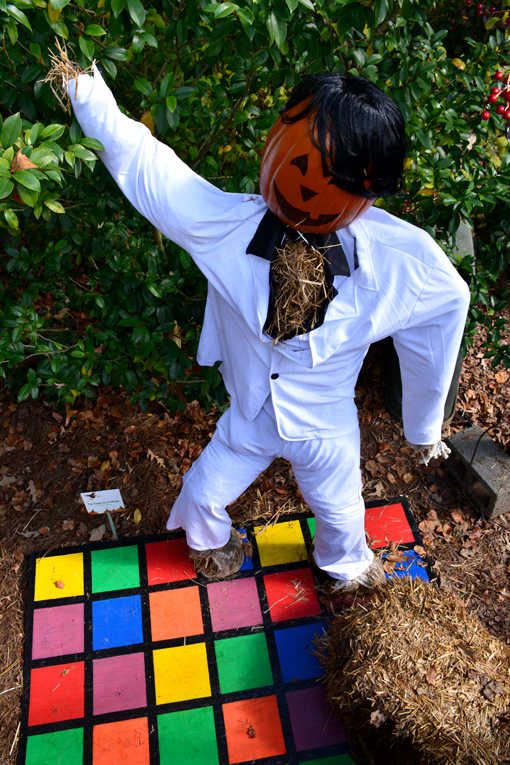 Be sure to bring a flashlight to see all the scarecrows if you're visiting after dark! The amount of cleverness at Scarecrows in the Garden seems boundless. The above "We Bare Bears" scarecrow greets visitors for another week--the exhibition and its relative programming conclude on Halloween. Make your way to the Atlanta Botanical Garden by Saturday to see Scarecrows in the Garden!